Now Fiscally Sponsored by Gray Area Foundation for the Arts! Safer DIY Spaces is an Oakland-based, fiscally sponsored coalition of architects, artists, contractors, and community organizers that emerged in the wake of the tragic Ghost Ship fire in Oakland, CA in December 2016. We offer confidential guidance, technical assistance, and labor to the frequently vulnerable members of the Bay Area's communities who live and/or work in non-traditional "DIY" spaces. 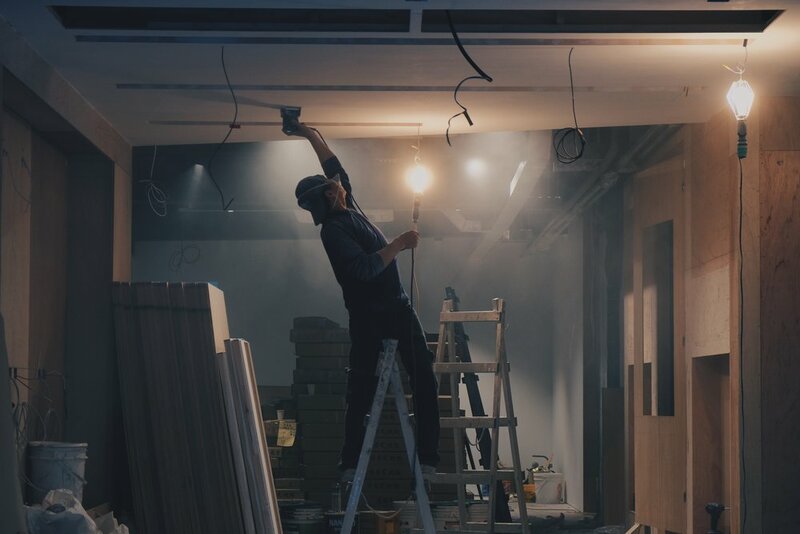 DIY communities not only face the threat of displacement but also the risk of physical harm because the spaces in which they work or reside frequently require repairs and/or may be out of compliance with current building, fire or zoning codes. While assuring complete anonymity to those in these spaces, Safer DIY Spaces provides support in the form of pre-inspection walk-throughs and guidance, reparative construction, and permits to help arrange for the materials and labor necessary to implement core life-safety improvements. We advocate for these communities to building, fire and planning departments and actively work to encourage cities to adopt safer, more compassionate codes. Finally, we help arrange for the permanent tenant or community land trust acquisition of eligible buildings for permanently affordable DIY sites. Omni Commons, perhaps (one of?) the last fully legal, safe and occupant-owned DIY sites left in Oakland. Typically DIY spaces are commercial, mixed-use buildings occupied for under-permitted live/work or assembly (gatherings), usually built-out over years by low-income artists, craftspeople or community organizers involved in some consistent form of under-the-radar cultural production long central to the Bay Area’s vitality and diversity. A short list of early and formative DIY sites in the Bay Area long recognized as being historically central to its cultural heritage of producing art, music, performance and social change include: Project One, The Farm, Project Artaud, Shadetree, CELLspace, 924 Gilman, and countless others. The core of Safer DIY Spaces is a small team of committed architects, building professionals, artists, and community organizers with many decades of combined professional experience in the building trades. At the same time, we also have equally deep, decades-long ties to the DIY communities of the Bay Area. Along this axis of trust, our small group works very hard to ensure that the life-safety and legalization needs of individual, low-income DIY spaces are being addressed without displacement. We do this through a combination of technical aid, physical improvements, and advocacy. We work as code-compliance ‘translators’ between stakeholder tenants, owners, and local Authorities Having Jurisdiction, such as Code Enforcement, Fire Prevention, Planning/Zoning, and City Administration departments. We aim to support a diverse and creative cultural community throughout the San Francisco Bay Area in which alternative or otherwise non-traditional DIY spaces have long played a crucial role. We strive to foster equitable access to resources, and meeting human needs over private interests or corporate profit. We operate outside any government-affiliated program, and are well-positioned to understand the needs of DIY spaces. Our goal is to keep vulnerable communities in their homes, workplaces, and performance areas by making them safer. We believe that DIY spaces provide creative and alternative ways of living, working, and building community - and that these interstitial spaces have become even more vulnerable in the wake of the Ghost Ship fire, and many face imminent displacement. We recognize the crucial importance of anonymity for DIY spaces, and uphold the greatest degree of privacy we can for those we serve -- ensuring, to the best of our ability, safer living conditions without fear of media misrepresentation or unwarranted scrutiny.